‘Kiwi Keith’ Holyoake, the first officially designated deputy PM (1954), was our third-longest serving leader. Although critics derided his ‘plummy’ voice, this populist kept his number listed in the phone book and usually walked to work. He was an economic nationalist. Although criticised for sending troops to the Vietnam War, he is now seen as ‘the most dovish of the hawks’, who did the bare minimum to keep America happy. Holyoake ended his formal education aged 12. In 1932 he entered Parliament for Reform, lost his seat six years later but was earmarked for the safe seat of Pahiatua, which he held from 1943. National’s rising star became deputy leader four years later and PM in 1957 when Sid Holland reluctantly resigned. 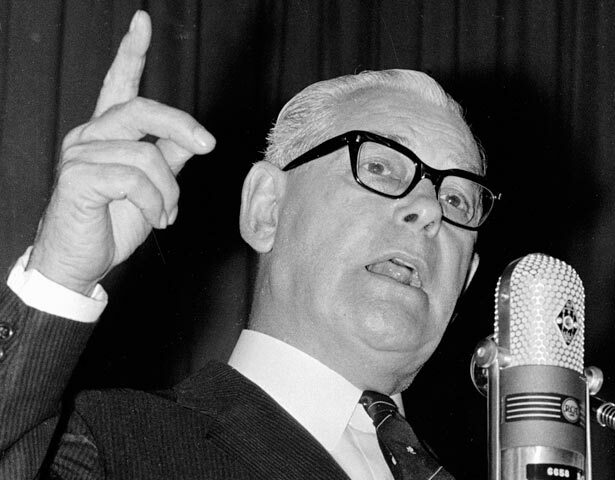 Weeks later Labour’s victory ended Holyoake’s prime ministership, but he led National back in November 1960 and became its longest-serving PM. The early ‘Holyoake Years’ were prosperous, but the country’s terms of trade deteriorated in the late 1960s and National barely won in 1969. Holyoake stepped down in February 1972 months before the Labour victory. When National returned to power in 1975, Robert Muldoon made Holyoake minister of state, a role he still held in 1977 when Muldoon controversially appointed him governor-general for three years. Holyoake served competently if not brilliantly, though no subsequent PM has repeated the experiment of sending a politician straight from Cabinet to Government House. In 1980 Sir Keith became a Knight of the Garter, a rare honour. We have 2 events in history, 26 biographies, 10 articles, related to Keith Holyoake.